Faux Bois (fō bwah) ~ French for false wood, refers to the artistic interpretation of wood or wood grains in various media. The craft has its roots in the Renaissance with trompe-l’œil, but became popular when in 1875, Joseph Monier designed the first bridge of reinforced concrete, sculpted to resemble timbers and logs. 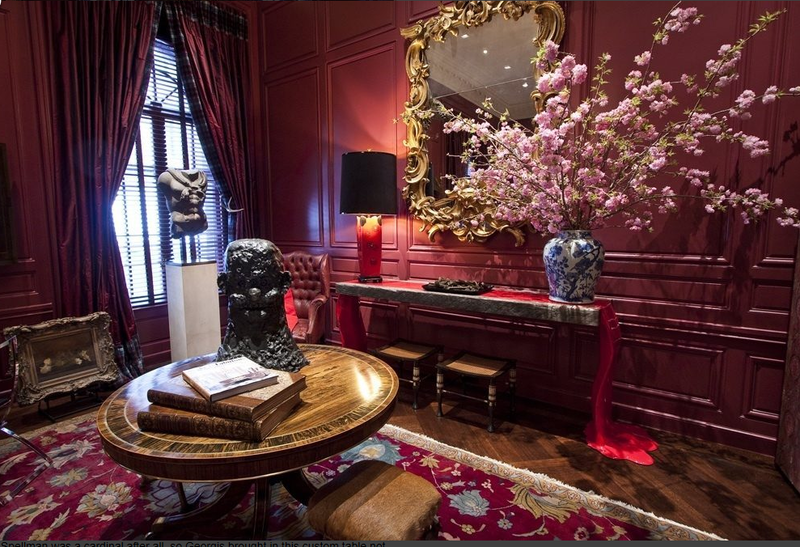 Faux bois was first crafted with concrete and mortar applied to a frame built of iron materials like chicken wire and barrel bands and sculpted by “rocailleurs” or French garden craftsmen to resemble lifelike representations of wood especially logs, roots, branches and bark. Most popular in the late 19th century through the 1940s, true faux bois has largely disappeared with the passing of those most experts. I often see some of these remaining pieces- prized by collectors and usually planters, benches or birdbaths- at the Clignacourt flea market. Still haven’t figured how to get them home with me! Today, faux bois effects can be achieved by painting, printing, or imprinting a design on textiles, home accessories, walls, and furniture. Want to learn more about the technique and one of the artisans reviving the craft? See Logging Out- in Traditional Home. The classic motif is “hot” again especially when it comes to soft goods. 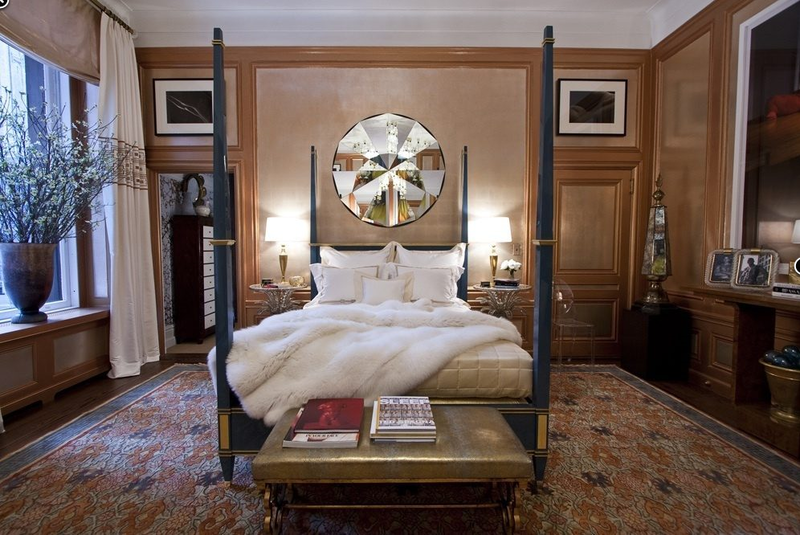 We spotted rugs, bedding, pillows and fabrics at recent markets in High Point, Atlanta and Vegas. Think of it as Faux Bois Rebooted; the latest riffs are playful, imaginative and a great way to add texture and pattern in a room. Moire, Faux Bois’s first cousin, is coming along for the ride back up the trend curve. Several A list editeurs (re)introduced moire earlier this year. Look for it to start popping up in your sample books soon. 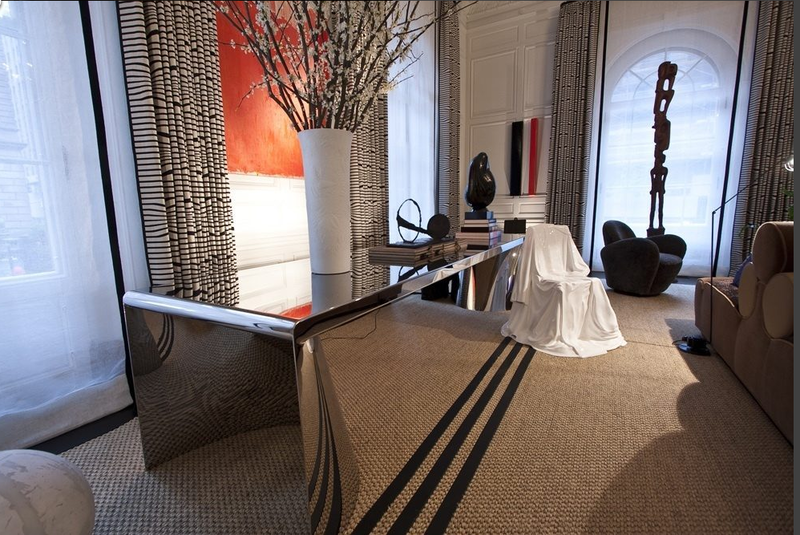 These upholstered walls are stunning in Dedar’s Losange Moire. Spin City’s cotton print is available on Etsy. I love these log bolsters; they are equally at home in a kid’s room or a luxe lodge. Fresh interpretations for wallpaper- Piet Hein Eek’s photo realistic wood slices from his Scrapwood collection. Top: Farrow and Ball’s Parquet hand blocked design. Bottom: Graham and Brown’s planking says hand drawn. 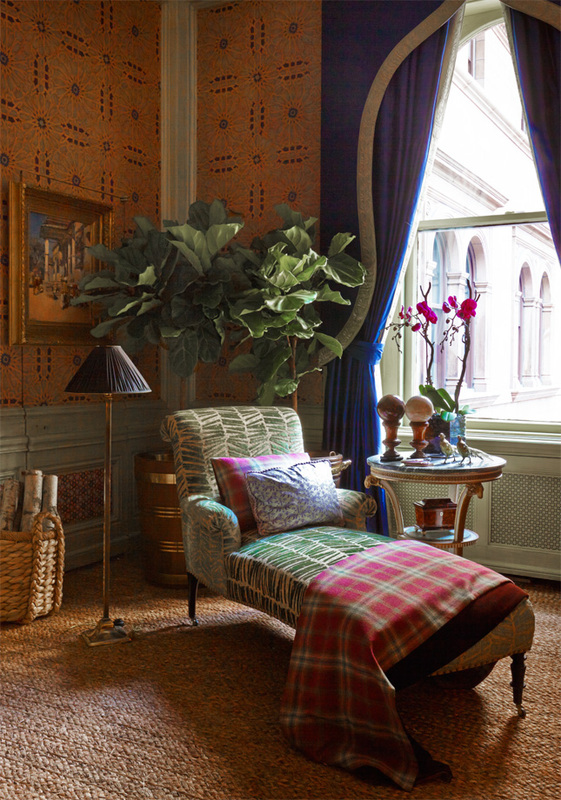 Thibaut’s Eastwood wrapped drapery poles. Schumacher’s take on the classic design in embossed velvet. 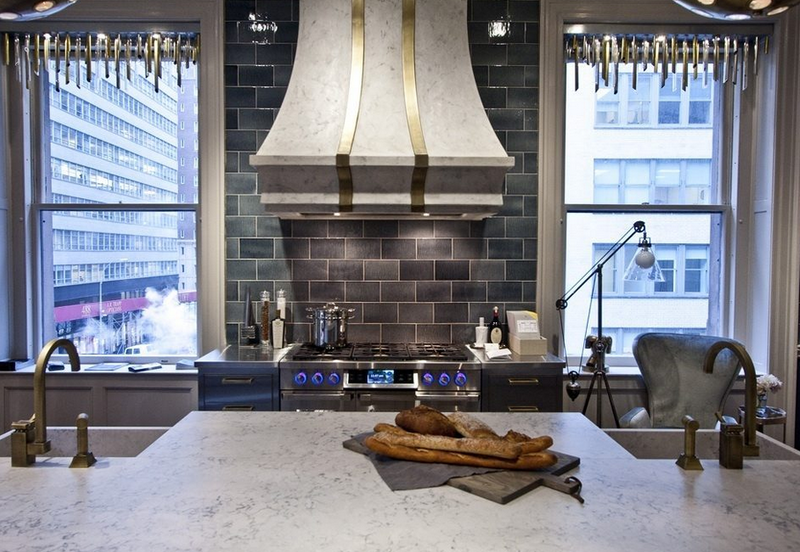 Faux Bois looks can range from quirky to sophisticated. Here Kelly Wearstler interprets the classic motif in a contemporary embroidery for Groundworks. We spotted Surya’s Hurricane rug , Callisto Home’s beaded faux bois pillows and Kevin O’Brien’s ombre faux bois embossed velvets at summer markets. Every February, the Sherwin-Williams trend team convenes in a large conference room in our Cleveland, Ohio, headquarters to start work on the yearly color forecast. We share our most significant research, deliberate over tremendous amounts of information, synthesize it into a set of well-defined concepts, then use them to validate the color and design directions for the coming months and year. Despite the fact that it’s so dreary, overcast and frigid outside — or maybe because of it — the conference room really heats up, fueled by passionate conversation and spirited debate. Materials, imagery and color samples fairly fly around the room, as we assemble seemingly infinite arrangements. Success comes when we finally, finally — and collectively — agree which drivers affecting future design trends are meaningful, relevant and validated; that the design philosophies and sensibilities of the industries’ influencers support the drivers; and, most important, that our chosen hues are reflective of the consolidated findings behind each color story. This year’s conversations wandered in so many different directions — from outer space to under the oceans, from Africa to Brazil, from Japan to Hawaii. Research covered just about everything: architecture, community, urban development, economics, consumer behaviors, sporting events, fashion, craft, culture, change, astronomy, growth, balance, unexpected humor and serendipity. And of course photography, print, pattern, texture, materials and product design played important roles in helping to reveal the upcoming color stories. Life is a Carnival, and we’re celebrating: from bold, ethnic-inspired colors, designs and crafts to the Bohemian lifestyle. But today’s wandering nomads aren’t starving artists — they’re fusing the carefree spirit of the gypsy with the sophistication of the jet set. Artisans and purveyors of luxury goods are getting in the spirit, putting an irreverant spin on their work. South Africa and its colorful art scene exert a strong pull, while the 2016 Summer Olympics will rivet the world’s attention on Rio de Janeiro. “To boldly go where no man has gone before.” That phrase was fantasy when it was born during the Sputnik era. Today we’re living it. The sci-fi dreams of the past have become everyday reality — from space tourism to undersea resorts. No longer confined to our earthly plane, we look to the beyond and find colors that are supernatural and magical. Unusual atmospheric events, including a decade-best aurora borealis and a rare sequence of “blood moons,” will keep our focus on the heavens in the months ahead. Happy days are here again! We’ve weathered the recession. Our revived good spirits echo the optimism that followed World War II, when GIs returned home from exotic locales. Like that era, we’re expressing ourselves with bright florals, but today, our fascination with the tropics runs deeper. We’re exploring the secrets of the rainforest, applying the medicinal and cosmetic benefits of its botanical bounty. We’re looking to the natural world in other ways, too, incorporating green spaces into even dense urban environments — trusting in nature to keep our spirits bright. Like a butterfly emerging from its cocoon, we’re poised for change. As modern life and technology rush at us, we seek an oasis where we can find balance, mindful living and tempo giusto (the “right time,” or the steady, regular beat of the heart). We look to earth and sky for inspiration, finding raw beauty in striations and gently blurred hues and patterns. Artisans break the mold, creating objects that aren’t what they seem. Shapes are layered and deconstructed. In this moment, silence is the greatest luxury, and metamorphosis is the mother of invention. I love showhouses. As a participant they are a grind, but as a visitor I always walk away with some bit of inspiration or a new idea or way to do something. Isn’t that why we go? My thing is window treatments, so I am the one peeking behind the panel to see how it was hung or lifting up a hem to check out construction. 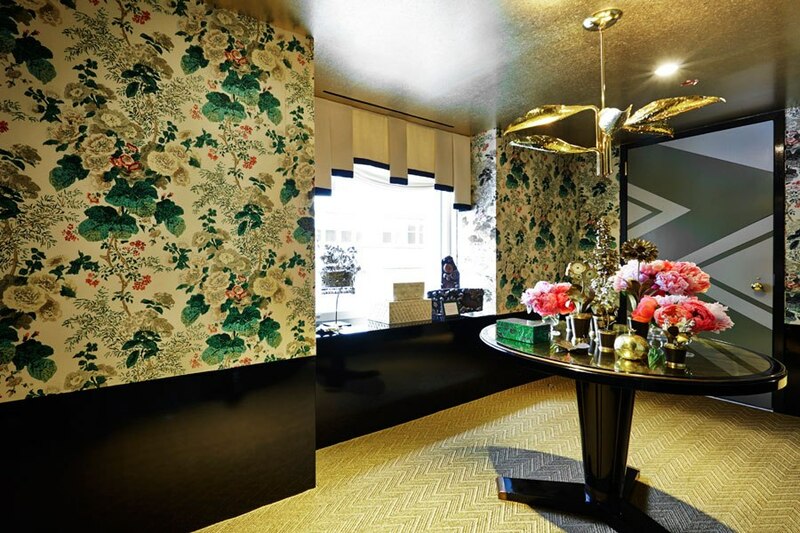 This year Kips Bay did not disappoint when it came to window fashion inspiration. I was really happy to see more going on at the windows than a pair of stationery panels hung from a rod and rings. Been there done that– way too many times. So is the layering I saw a signal that windows will play a bigger role when designing a room in the coming months? Let’s hope so! This year’s Kips Bay Decorator Show House made an unprecedented venue shift as it took over Manhattan’s quintessential mansion at 457 Madison Avenue, The Mansion on Madison. 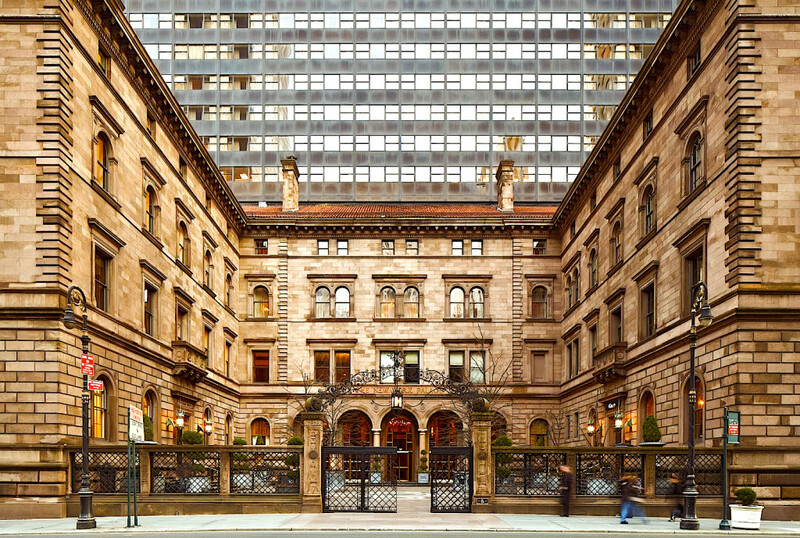 Situated in the heart of Manhattan, the famed building which was originally the north wing of the famous Villard House, is connected by a grand courtyard to adjacent luxury hotel, The New York Palace and steps from St. Patrick’s Cathedral. 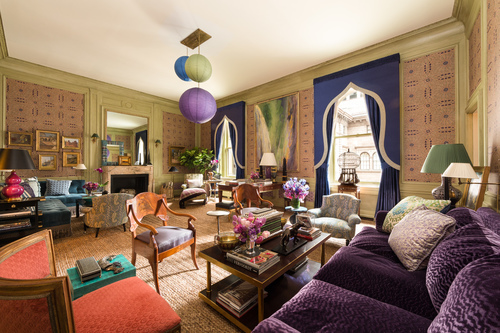 Moroccan inspired cornices over panels frame the arch windows of the room. Contrast woven metallic jacquard banding is found on both the drapery leading edges and hems and the cornice. 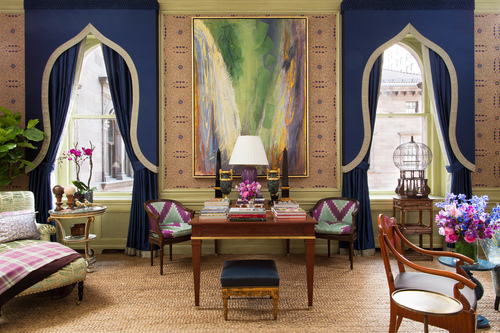 The scale of the cornice is masterful; making the window become a focal point in this room. What you might have missed is the smocking tape pelmet at the top of each cornice. Darryl Carter was inspired by the collected home concept and used it as a starting point to build a wonderfully layered room. 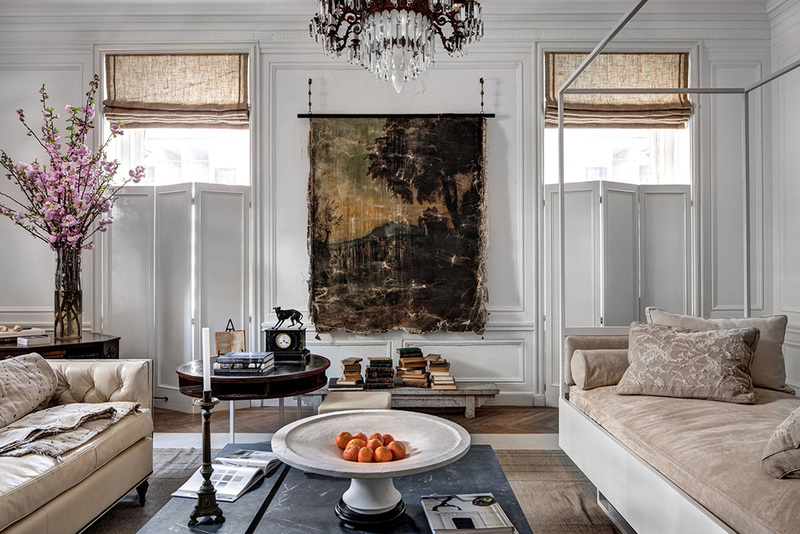 I love the canvas between the windows and his take on “combination treatments” mixing paneled shutters and linen Roman shades with banding on the sides. 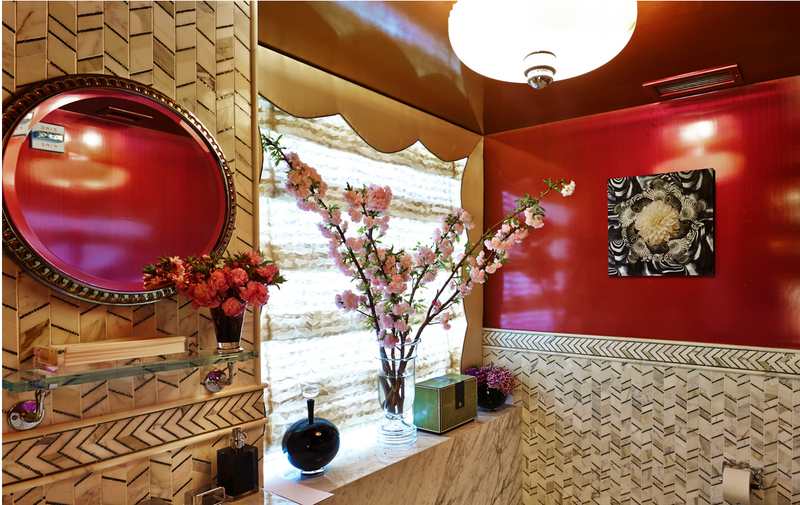 Young Huh transformed a freight area into a ladies and gentleman’s powder rooms. The wall covering is hand blocked fabric . ( See two of the blocks used to print the fabric on the window sill.) 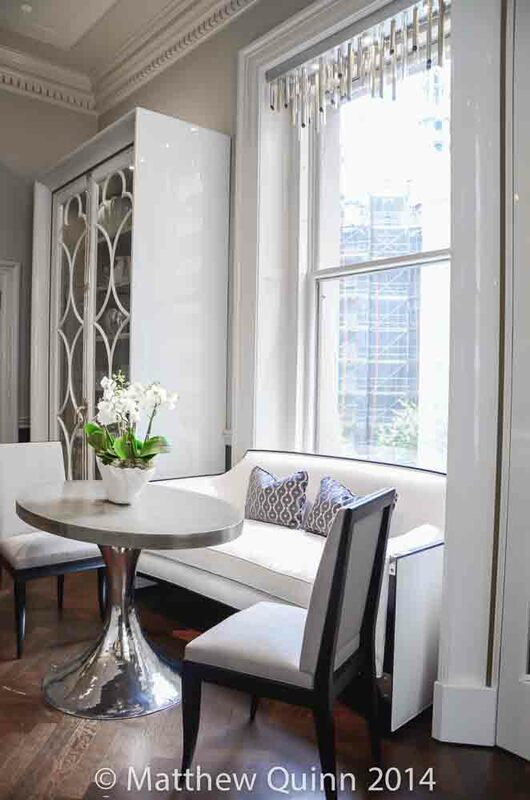 The wainscoting in patent leather. With a lot going on, Huh kept the window treatment simple; it feels like a kimono to me with draped pelmets banded at the hem for definition. First off – gorgeous Palladian windows. Second- I love the twist on traditional sheers and panels by using flat scrim panels with weighted hem bars. I love the contemporary mood it sets and how the light filters through shadowing the window architecture. Same windows and similar look , but this time Montoya turns the scrim into a flat Romans and adds inset banding on each side in black. 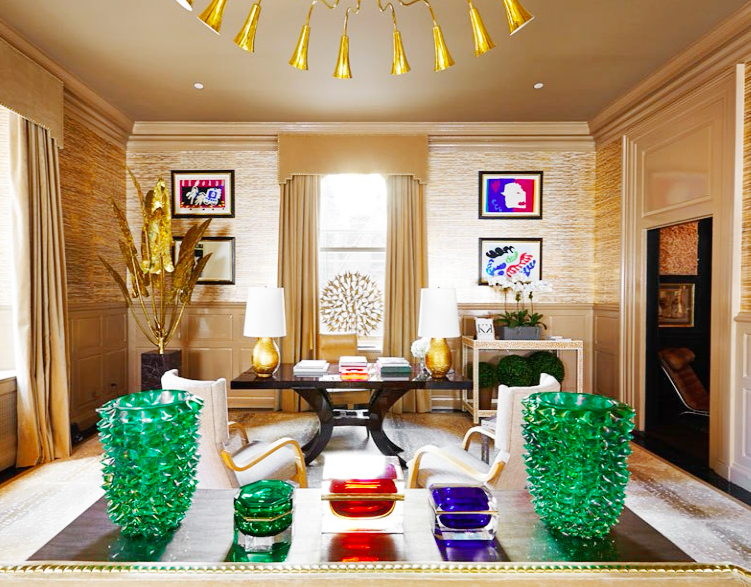 Kristen Kelli are know for their love of gold mixed with pops of bold color. These geometric stepped cornices are edged on all four sides in gold nailheads accenting the metallic grasscloth wallcovering . 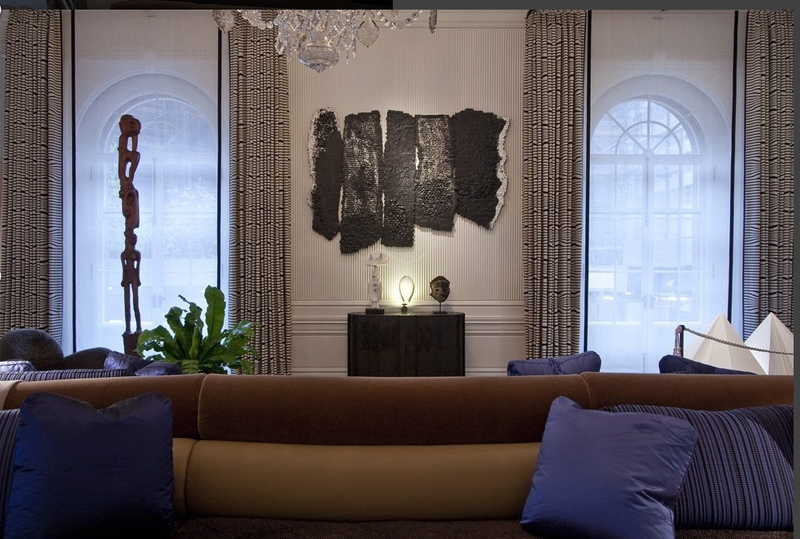 Love the appliqued band on these panels in Cullman and Kravis’ bedroom. 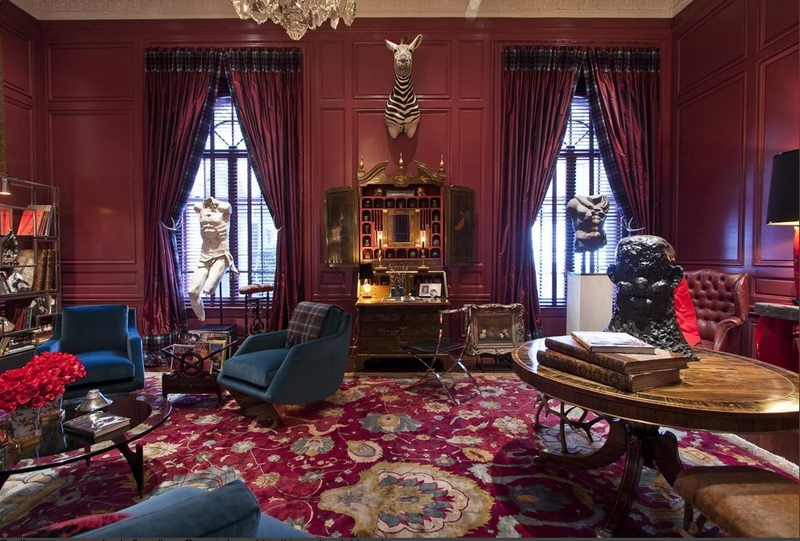 Almost an after thought , because there is a lot going on in this room- the draperies are red silk with large bands on the hems and leading edges in Royal Stewart tartan. The taped headings are also faced with the tartan and the treatment is held back with antlers. Last but not least, I LOVE these valances by Matthew Quinn inspired by St. Pat’s and made from pipe organs. They are mounted into sheet metal frames and inside mounted. Genius! For several years, it seems that the only variation to decorative pillow design is the fabric choice or what we call pattern driven design- standard pillow forms in poly or down mixtures; covered in solid or graphic patterns with knife edges or maybe cording . B Decorative pillows at the higher end have surface embellishment of trims and fabrics applied to add dimension or pattern. Where we’re moving is toward engineered design- the look of the pillow is dictated by the structural pattern of the design. Fabric is combined, cut and sewn in a specific way to achieve the desired look. With in this overriding trends are several themes we’ve spotted when it comes to what’s trending in decorative pillows. Here’s our cliff notes version.